Impress fellow warriors when you arrive at your next feast with the Carved Stallion Drinking Horn with Stand. 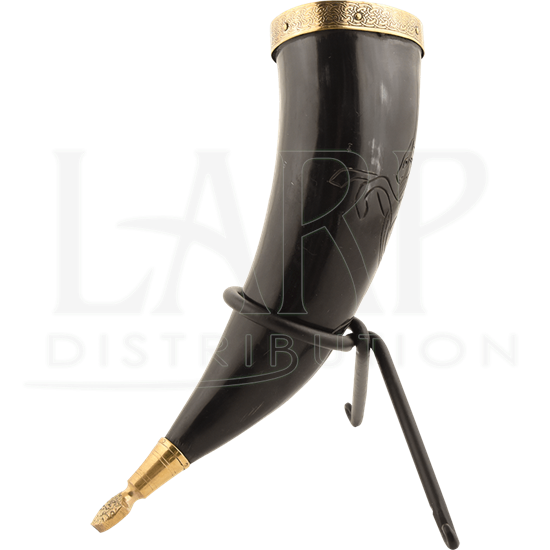 Be the merriest Viking of the bunch as you take a sip from this brass-accented natural Viking horn. Fully functional, this Viking feastware piece is made of natural bull horn, giving it an authentic look and feel. 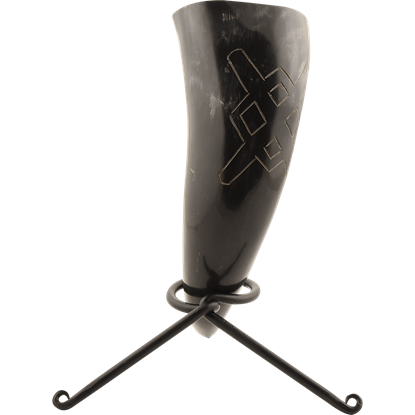 The drinking horn has also been engraved by hand with the image of a rearing stallion in typical Viking style. A brass accent frames the rim of the horn, itself engraved with traditional knotwork. 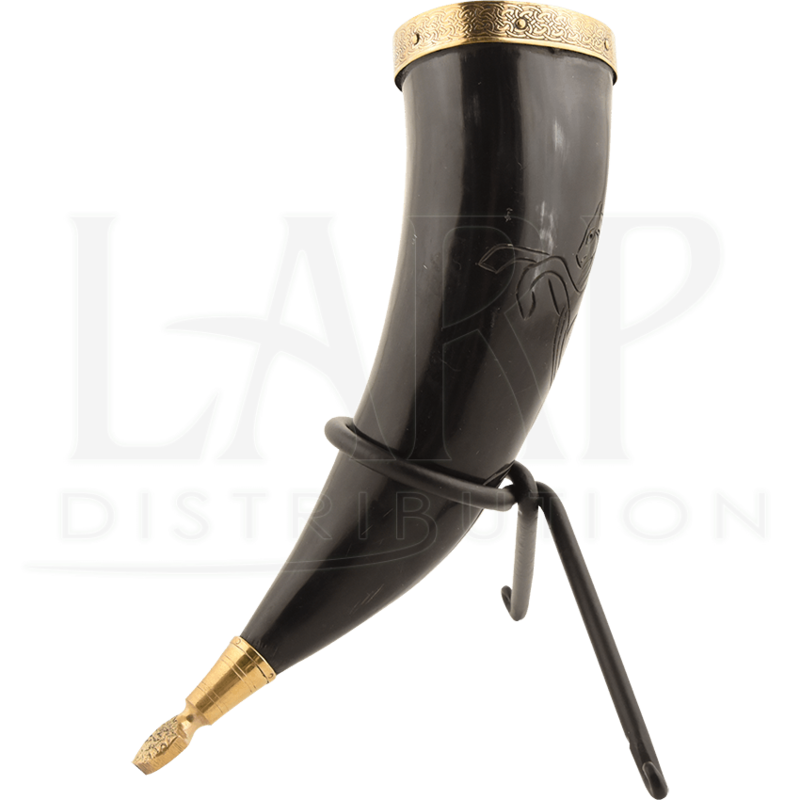 The end of the Viking horn also features a matching brass cap. A metal stand is included for easy display. With both refined style and a historical feel, the Carved Stallion Drinking Horn with Stand is perfect for your next Norse gathering or medieval dinner. Please note that, because this horn is natural, yours may vary in color and size from what is shown here. Your drinking horn will arrive to you clean, however we still recommend that you thoroughly clean your drinking horn before use. Soak the drinking horn in hot water with dish soap. Scrub the inside of the horn with a bottle brush, making sure to get as far into the tip as possible. Rinse well. Fix the horn to stand upright and fill with warm water. Drop two denture tablets into the horn and let it sit overnight or for at least 8 hours. The ingredients in these tablets will provide further deep cleaning. After the horn has soaked, scrub with a bottle brush again and rinse well. If you desire, you can coat the inside of the horn with a food safe epoxy. This would make washing much easier and less time consuming. If you choose not to seal the inside, just follow the steps above when washing. Measurements are approximate. This horn is a natural product and its shape and size will vary. Few things are as undeniably Viking as borre knotwork and drinking horns. 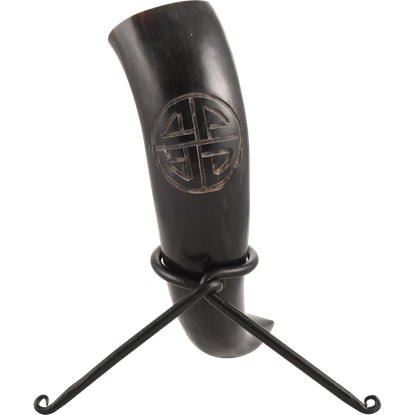 The Shield Knot Drinking Horn with Stand perfectly combines both of these Norse aspects to bring you a Viking horn that would make even the All-Father proud.